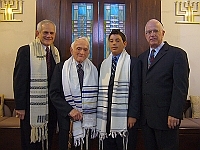 Today, many parents are opting to celebrate their child’s Bar or Bat Mitzvah away from home. Traditionally, the choice has been Israel. But with the current economic and political uncertainty, other alternatives are often considered. We would like to offer another option: The facilities of Temple Beth Shalom, The Reform Jewish Congregation of Puerto Rico.We are a small (60 family), friendly, Reform congregation in the heart of beautiful San Juan, Puerto Rico. We can help you create a warm, unforgettable, religious and family experience. For more detailed information please contact us at info@tbspr.org or at (787)721-6333.